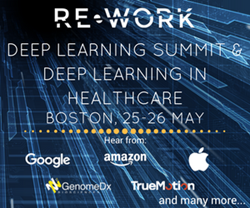 The 3rd global RE•WORK Deep Learning Summit is returning to Boston on 25-26 May. This year, RE•WORK will introduce an additional track focusing at Deep Learning applications within health and medicine. "There is a huge potential for medical applications of deep learning to help lots of people" -Yoshua Bengio, Université de Montréal. The RE•WORK Deep Learning Summit is returning to Boston on 25-26 May. The two day event will showcase advancements in Deep Learning and explore how the latest methods and tools are being applied to solve problems in business and society. One industry ripe for disruption is the healthcare sector, thus this year, there will be an additional track focusing on Deep Learning applications within health and medicine. The events will bring together over 400 industry experts, startups and researchers, covering topics such as transfer learning, image recognition, neural networks and reinforcement learning and how they will impact business efficiency and solve challenges in the healthcare sector. As the summits are co-located, attendees will be able to enjoy additional agenda sessions, workshops and networking opportunities, allowing them to further expand their knowledge and ensure their organisation is up-to-date with the latest trends, advancements and impactful applications in the field of artificial intelligence. The events attract a global audience, with confirmed attendees including Amazon, Apple, Adobe, eBay, Disney Research, Google, Facebook, Thomson Reuters, MIT, UnitedHealth Group, Novartis, JetBrains, Audi, RBC, GSK, Roche and many more. David Plans, CEO of BioBeats, will be discussing how using deep learning approaches will help people be well, fight stress, and be more productive. Do you have an interesting topic for discussion, or know of someone who does? Let us know by suggesting a speaker here. Can’t attend the live events? We have a new and improved Video Hub platform where you can access the event content on-demand; including the presentations, slides, panel discussions and expert interviews. Email Chloe at cpang(at)re-work.co if you’d like information on introductory membership pricing.